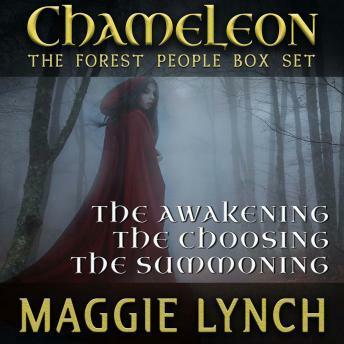 Now you can get all three audiobooks of the Forest People Trilogy in one boxset.Chameleon: The AwakeningA teenage shifter turned captive. A magical land in danger. Is she a monster or a savior?Sixteen-year-old Camryn Painter struggles with more than the usual teenage identity issues. As a human chameleon, emotions trigger a transformation into the visage of whomever she sees. But when her foster parents die in a crash and she's taken captive by so-called scientists, she's not sure if she's human or just a freak of nature.Desperate to control her abilities and escape, Camryn emerges from her prison and into a dangerous magical forest. Surrounded by dragons, faeries, and other extraordinary creatures hungry for her power, some in the forest claim she's their prophesied savior. Unfortunately for her, that declaration triggers a supernatural civil war.Can Camryn unite the fractured forest people, or will her powers erase more than her own identity?Chameleon: The ChoosingCamryn Painter has enough identity issues without discovering a deadly new magic coursing through her veins. Though her chameleon-like abilities herald her as the forest people's savior, she's terrified by the growing dark power within her. And it only gets worse when she realizes that to control this new magic she'll have to bond with a deadly Thunder Dragon.As Camryn embarks on her dangerous quest, she discovers that the same human tyrants who experimented on her are behind multiple grisly murders as well. To fulfill her destiny, she may just have to infiltrate her former prison.Can Camryn master her new abilities to stave off more death, or will power-hungry humans destroy her magical home for good?Chameleon: The SummoningShe turned a man to ashes. He scattered himself across time and multiple dimensions. Can she recreate him in time to save his life and prove she is the chosen one?Surviving the ultimate transformation and the Agnoses predators, Camryn now faces the rise of a new Mazikeen Queen who thinks nothing of calling the darkness for her own needs. With the Forest People on the brink of war, she retreats to the solitude of the Cloud Forests. To grieve. To heal. To accept she is the Chameleon of prophecy.But the ancient world proves to be anything but quiet and she is far from alone. Guided by the First Forest People, who are now elemental spirits, Camryn must master the powers of air, earth, water and fire. Only then can she enlist her thunder dragon, control time itself, and save Dagger from the void.Even then, her quest is far from over. With the realms of Forest and Human pitted against each other, one world teeters on extinction while the other tips toward eternal darkness. Only Camryn seeks a balanced resolution, and with it an impossible choice requiring her to make the greatest sacrifice of all.If you like incredible worlds filled with unique creatures, intriguing twists and turns, and heartfelt coming-of-age stories, then you'll love Maggie Lynch's enthralling trilogy.Buy the Forest People Trilogy now and save money while reading/listening to these adventures. Travel a world of dragons, shifters, and magic, while facing the ultimate light and dark unification of the soul.